“The industrial, steely strength of the Kelpies horses come alive within their towering, angular NYC surrounds. I love the city’s intense juxtapositions, contrasting layers and rich architectural diversity. Inspired by exceptional Scottish Sculptor Andy Scott and his magnificent Kelpies, the Iona Crawford Beauty and The Beasts Capsule Collection concept was first conceived in the mind’s eye of the designer over a mug of tea with the sculptor himself, in his cool, steely, hanger-like warehouse studio in Glasgow. Surrounded in the dark expanse by towering steel built horses, cold hard concrete beneath their elegantly crafted equine libs, Iona was left with no doubt as to the collection she had to sculpt in their honour. The rich contrast yet subtle parallels between these great beasts and an intricately tailored feminine garment is inexcusably intriguing. 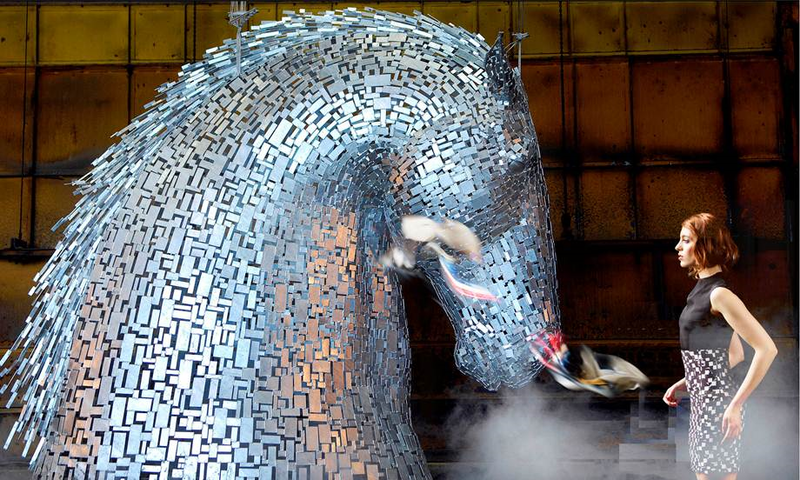 Delving further into the concept of the Kelpies, a title inherited from their inception eight years ago, and to the sculptor’s personal legacy as the son and grandson of working heavy horsemen in central Scotland, Iona became further engrossed, surrounding herself by Clydesdales, Shires and Percherons, the equus magnus of the European north. The towering horse heads with their industrial aesthetic, structural columns and beams visible through the riveted laser cut steel plates of the skin, the manes rendered as geometric overlapping slabs of steel; a veritable ocean of equine inspiration collided to create the framework for the Beauty and the Beasts Capsule Collection. From the Collection: Acanthium Dress; light weight keyhole back wool delaine dress featuring large scale monochrome Silk Sequence Series inspired print.